BIRMINGHAM, Ala. — An Alabama police chief is under fire from a prominent atheist activist organization for conducting prayer walks in his city as a way to fight crime. The Madison, Wisconsin-based Freedom from Religion Foundation (FFRF) recently sent a letter to Birmingham Police Chief A.C. Roper to assert that his actions are unconstitutional and offensive to non-Christians. 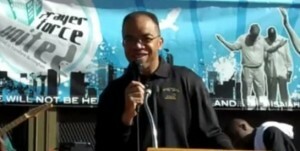 Roper, an ordained minister, is involved with the initiative Prayer Force United, a coalition between the chief, area churches and local residents to host monthly prayer walks and faith-based gatherings in areas of Birmingham that are most affected by crime. FFRF contends that Roper’s statements, being made in his official capacity, are unlawful because they promote Christianity and religion over non-religion. But Roper told reporters this week that he is not ashamed of his Christian beliefs and is unapologetic for the work that has been done to fight crime in Birmingham. While he has not suggested that he will comply with FFRF’s demands, Roper insists that he is inclusive of all religions in his position as chief. “We are and will continue to be extremely inclusive, including supporting interfaith events as we have in the past,” he told local television station ABC 3340.